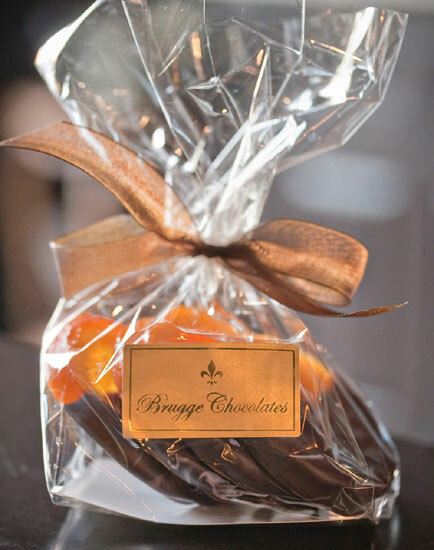 We combine the finest fruits from around the world with premium French chocolate to create an outstanding selection of candied, glacé, crystallized, and dried fruit. These succulent glacé apricots are from California. We hand-dip them in pure dark chocolate and package six of them (approximately 8 1/2 oz.) in a box, tied with a ribbon, for a beautiful and delicious treat. We hand-dip imported French candied lemon peel in dark and white chocolate to create 3 different selections of this flavorful treat. All three varieties are packaged in a crystal-clear box to highlight their elegant beauty (approximately 3 5/8 oz.). 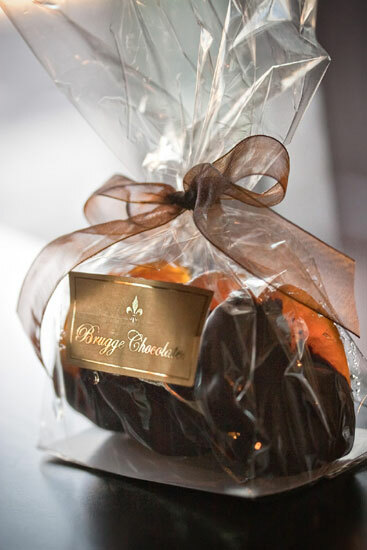 We begin with candied orange peel, imported from France, and hand-dip each piece in either dark or milk chocolate to create 3 different selections of this exquisite product. All three varieties are packaged in a crystal-clear box to showcase their delicate beauty (approximately 3 5/8 oz.). We use spicy slices of crystallized ginger and dip them in our premium dark chocolate to create a sophisticated indulgence. Our ginger is hand-packed in a crystal-clear box that showcases the contrasting beauty of the ginger and dark chocolate (approximately 5 ¼ oz.). Our sweet but zesty glacé orange slices are from California and have the translucent beauty of stained glass. We hand-dip each orange slice in our 64% premium dark chocolate, for a perfect visual and culinary pairing. 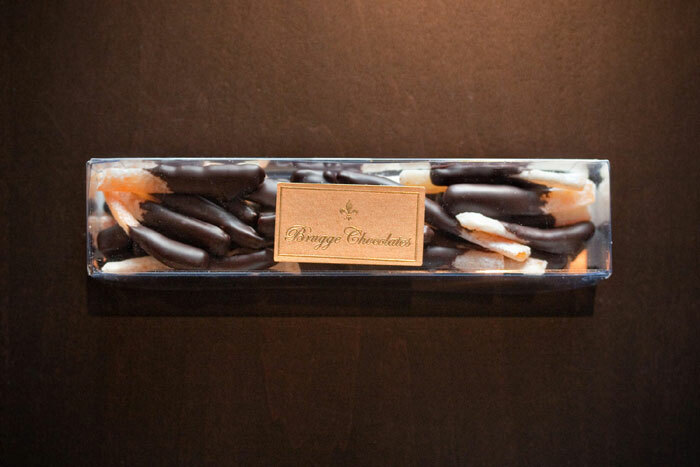 Four Dark Chocolate Glacé Orange Slices (approximately 4 ¼ oz.) 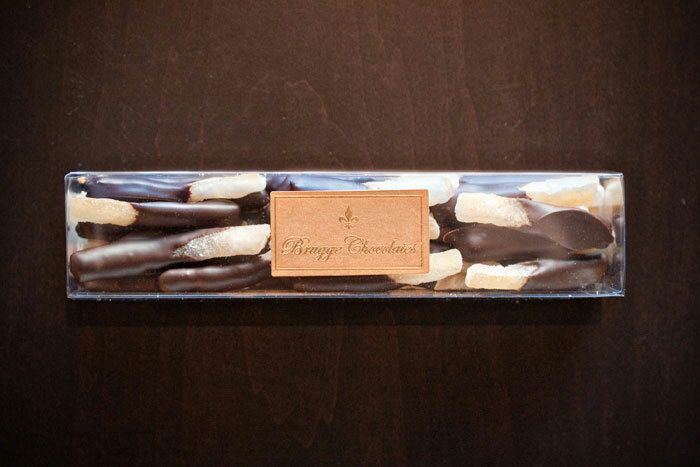 are packaged in a cellophane bag that is tied with a ribbon for a stunning presentation. The finest dried Turkish apricots are hand-dipped in 64% pure dark chocolate and then packaged in a crystal-clear box (approximately 4 ¼ oz.). Copyright © 2009-2019 Brugge Chocolates LLC. All rights reserved.